Analysis: A stifling Ravens defense forced Williams to see his fewest targets since Week 13, culminating in his lowest yardage total since Week 6. It's a far cry from his heroic performance last week against the Chiefs, and a reminder that Williams' fantasy production is largely dependent on game script, as Keenan Allen and Melvin Gordon continue to dominate the team's touches on a week-to-week basis. Williams caught three of his six targets for 45 yards in the 26-21 win Sunday over the Bengals. Williams caught all three of his targets for 52 yards in the 33-30 win over the Steelers on Sunday. Analysis: Williams was actually the third-most targeted player, drastically trailing Keenan Allen (19) and Austin Ekeler (eight) in that category. The 24-year-old is effectively a boom-or-bust fantasy option thanks to his limited opportunities, but the Chargers' efficient offense is such that you could never rule out a potential touchdown for the 6-foot-4 wide receiver in any given outing. Williams caught all four of his targets for 25 yards and two touchdowns in the 45-10 win over the Cardinals on Sunday. Williams caught two of his three targets for 56 yards in the 23-22 loss to the Broncos on Sunday. Williams (groin) doesn't carry an injury designation into Sunday's game against the Broncos after practicing fully Friday, Eric D. Williams of ESPN.com reports. Analysis: Williams wasn't targeted in the Week 10 win over the Raiders, which reinforces that he's a hit-or-miss fantasy option whose value is touchdown-dependent. Through nine game to date, Williams is averaging a modest 37.6 receiving yards, but he has made five trips to the end zone. He'll take aim this weekend at a Denver defense that has surrendered 16 passing scores through nine contests. Williams (groin) was added to the Chargers' Week 11 injury report after logging a limited practice Thursday. Analysis: Fellow wideout Keenan Allen (finger/hip) was also limited Thursday after practicing fully Wednesday, so the Chargers' wideout corps suddenly has a couple of key players to watch in advance of Sunday's 4:05 ET kickoff against the Broncos. Through nine games, Williams -- who was not targeted in Week 10 -- is averaging 37.6 receiving yards, but he has managed to make his mark with five TDs over that span. Williams did not record a target in the 20-6 win over the Raiders, but he carried the ball once for zero yards Sunday. Analysis: It was a disappointing day for Williams as the second-year wide receiver saw Keenan Allen (nine targets, six receptions for 57 yards and a touchdown) and Tyrell Williams (six targets, four receptions for 46 yards) receive the vast majority of the looks on offense. It's clear the 2017 first-round pick is at best the fourth option heading into any given game, and as a result, makes for a risky play even in standard scoring formats. Williams caught a 30-yard touchdown in the 25-17 win over the Seahawks on Sunday. Analysis: Williams has turned his only catch into a touchdown in back-to-back weeks as the second-year receiver continues his surprisingly productive season. The lack of targets will continue to hold Williams back from emerging as a true fantasy asset, but owners could do worse when looking for a flex play, particularly next week against the struggling Raiders. Williams made the most of his lone reception during Sunday's 20-19 win against Tennessee, registering a 55-yard touchdown reception. Williams caught just one of his four targets for four yards and also carried the ball once for 10 yards in the 38-14 win over the Browns. Williams caught three of four targets for 45 yards during Sunday's 26-10 win over Oakland. He added a three-yard run during the contest. Williams caught one of his three targets for 15 yards during Sunday's 29-27 win over the 49ers. Williams caught four of his seven targets for 81 yards and two touchdowns in the 35-23 loss to the Rams on Sunday. Williams caught both of his targets for 27 yards and a touchdown in Sunday's 31-20 win over the Bills. Williams could be in line for additional snaps in Week 2 if Travis Benjamin (foot) is unable to play, Eric D. Williams of ESPN.com reports. Williams played a career-high 44 snaps on offense in Sunday's 38-28 loss to the Chiefs, Jack Wang of the Los Angeles Daily News reports. Williams grabbed five of six targets for 81 yards in Sunday's 38-28 loss to the Chiefs. 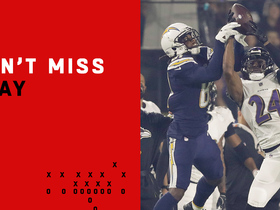 Analysis: Williams trailed only Keenan Allen in catches and yards among Chargers' wideouts Sunday, although Tyrell Williams caught a short touchdown pass. The second-year player had a nice training camp, so it wouldn't be surprising to see him take a step forward in 2018. 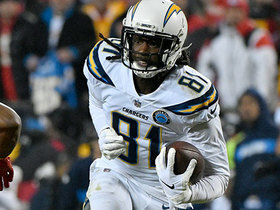 Williams has been one of the biggest risers during the Chargers training camp thus far, Jim Trotter of NFL.com reports. Analysis: Finally healthy after a season plagued by back and ankle injuries, Williams has been impressive this summer, creating real strides not just as a red-zone threat, but also as an all-around receiver. Williams will likely slot in behind Keenan Allen and Tyrell Williams (foot) as the team's No. 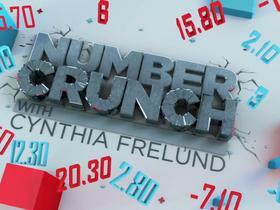 3 wideout when the season starts, but it wouldn't be a surprise to see the No. 7 overall pick in the 2017 NFL Draft progress further up the depth chart as he builds more acumen with quarterback Philip Rivers. Williams secured his only target for a 25-yard touchdown in the Chargers' 24-14 preseason win over the Seahawks on Saturday. Williams secured two of five targets for 18 yards during Saturday's preseason opener against the Cardinals. Williams is off to a good start at training camp, Eric D. Williams of ESPN.com reports. Williams (hamstring) was back on the field for Monday's OTA session, Eric Williams of ESPN.com reports. Analysis: Williams missed a handful of practices last week while dealing with a hamstring strain, but as expected, it was nothing overly serious. He should be good to go moving forward barring any sort of setback. 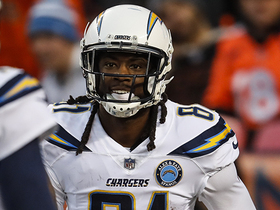 Williams heads into the upcoming campaign battling for a depth role behind the likes of Keenan Allen, Tyrell Williams and Travis Benjamin. Williams didn't participate in Thursday's OTA session due to a minor hamstring strain, Eric D. Williams of ESPN.com reports. Analysis: Williams only appeared in 10 games last season due to injury, but he entered the offseason program seemingly in good health. While he may miss some time due to the hamstring issue, it appears he's avoided anything serious. When healthy, the 23-year-old wideout should battle for playing time this season after recording only 11 catches for 95 yards as a rookie. However, the presence of Keenan Allen, Tyrell Williams and Travis Benjamin means he will likely have to earn his snaps. Williams is healthy for the Chargers' offseason program, Ricky Henne of the team's official website reports. Williams did not record a catch in Sunday's win over the Raiders, finishing his rookie season with 11 catches for 95 yards. Williams failed to record a catch in Sunday's 14-7 win over the Jets. Analysis: Williams did see three targets, but once again failed to make much with them. Injuries have largely hampered the 23-year-old's rookie season, turning Williams essentially into a red-zone specialist (four red-zone targets in nine games). At this stage in his career, being a red-zone specialist might not be a bad thing, but so long as the Chargers still have aspirations of a playoff berth, it's unlikely Williams will be put in a position to produce impressive fantasy numbers. Williams (knee) caught just one of his three targets for three yards in Sunday's 30-13 win over the Redskins. Analysis: Williams was hardly utilized given the Chargers raced out to a lead early in the contest. Still, it was encouraging to see the 2017 first-round pick get some action after missing essentially the previous two weeks due to a bruised right knee. Williams (knee) is active for Sunday's game against the Redskins. Williams (knee) will play Sunday against the Redskins, Adam Schefter of ESPN reports. Analysis: Williams missed last week's game and played just one snap in Week 12. Williams (knee) was a full practice participant Friday and is listed as questionable for Sunday's game against the Redskins. Williams (knee) will be limited at Wednesday's practice, Jack Wang of the Los Angeles Daily News reports. Williams (knee) is listed as out for Sunday's game against the Browns. Williams (knee) did not practice Wednesday. 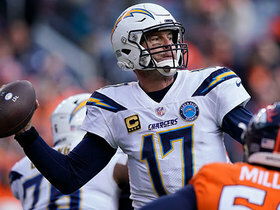 Analysis: Per Hayley Elwood of Chargers.com, the wideout is still sore and considered day-to-day by coach Anthony Lynn. Williams will be evaluated at end of the week, but at this stage, his status for Sunday's game against the Browns is cloudy. Williams (knee) didn't take part in practice Monday, Eric Williams of ESPN.com reports. Analysis: Williams didn't damage the ACL in his right knee but instead has a bone bruise in the aftermath of Thursday's win at Dallas. On Monday, head coach Anthony Lynn termed Williams "day-to-day" with soreness, which is expected to sideline him Sunday against the Browns and potentially beyond. Expect Travis Benjamin to benefit the most from Williams' absence, but this passing attack relies upon Keenan Allen more than any other wide receiver. WIlliams is dealing with a bone bruise in his right knee rather than any damage to his ACL and isn't expected to play Week 13 against the Browns, Ian Rapoport of NFL Network reports. Head coach Anthony Lynn said Friday that Williams didn't injure the ACL in his right knee Thursday at Dallas, but the wide receiver is still under evaluation. Analysis: Williams is expected to miss some time as a result of the injury, but the amount of time required for recovery remains unknown. Until the Chargers hone in on the nature of the ailment, his status will be up in the air. Williams will undergo an MRI on Friday to determine the extent of his knee injury, Ian Rapoport of NFL Network reports. 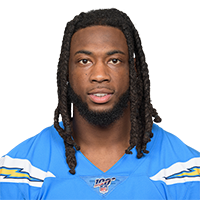 Analysis: The good news is the Chargers believe Williams' ACL is not damaged, but the bad news is he is expected to miss time with the injury. More should be known about Williams' status moving forward after the results of his MRI are released. Williams (knee) has been ruled out of Thursday's game in Dallas. Analysis: The Chargers didn't waste any time downgrading Williams from questionable to out, indicating his knee injury may be a serious one. During his ride to the locker room, his right leg was extended in front of him, so the medical staff wasn't taking any chances with the rookie wideout from the outset. 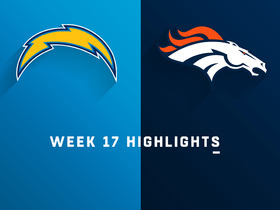 Expect the Chargers to touch on the ailment in due time. Williams is questionable to return to Thursday's contest at Dallas due to a knee injury. Analysis: Tending to a knee issue in advance of this game, Williams maintained limited standing Monday through Wednesday before he was given questionable availability. 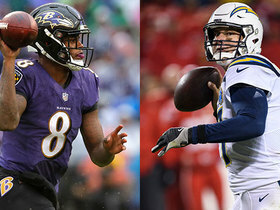 He avoided the list of inactives but wasn't targeted on the Chargers' first drive, after which he has carted to the locker room with his leg held straight in front of him, per Dan Woike of the Los Angeles Times. While worrisome for the rookie, upcoming tests will determine the severity of the ailment. Williams (knee) is listed as active for Thursday's game against the Cowboys. 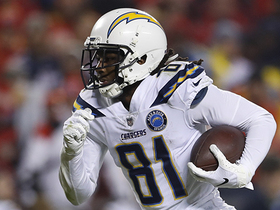 Analysis: As is Travis Benjamin (abdomen), with both players profiling as speculative Week 12 fantasy plays while working in a crowded Chargers pass-catching corps. Williams did record career highs in catches (five), targets (eight) and receiving yards (38) in this past Sunday's 54-24 win over the Bills, but the 2017 first-rounder will need to string together some productive outings before his upside translates into fantasy reliability. Williams (knee) is expected to play Thursday against the Cowboys, Adam Schefter of ESPN reports. Williams (knee) remained limited at practice Wednesday and is listed as questionable for Thursday's game in Dallas. Williams (knee) was a limited participant in Tuesday's practice session. Analysis: Williams was limited for the second straight day with the knee injury that he's dealt with all season. He posted a season-high five catches for 38 yards last week. His potential fantasy impact is limited as long as he's under a cap from his knee injury. Williams (knee) was listed as a limited participant on Monday's injury report. Analysis: Entering Sunday's game against the Bills, Williams had put together four catches (on seven targets) for 46 yards across the first four appearances of the season. He proceeded to surpass those marks in both receptions (five) and targets (eight) while posting a career-high 38 yards Sunday. Until further notice, Williams' reps will remain under a cap due to the knee injury that delayed his professional debut. Williams caught five of his eight targets for 38 yards in the 54-24 win over the Bills on Sunday. Williams caught both of his targets for 24 yards in the 20-17 loss to the Jaguars on Sunday. Analysis: The two catches actually represents a career-high for Williams in an admittedly small sample size. Still, the 2017 first-round pick has yet to see his snap count jump upwards, with Keenan Allen, Tyrell Williams and Travis Benjamin each seeing more playing time than the 23-year-old. 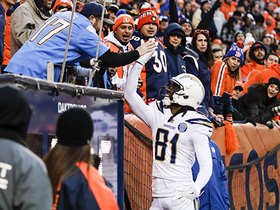 For the moment, Mike Williams represents an intriguing stash option should the Chargers eventually fall out of postseason contention and opt to utilize their young wide receiver more frequently. 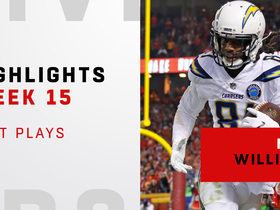 Watch the best plays from the Los Angeles Chargers wide receiver Mike Williams' huge night in his Week 15 matchup against the Kansas City Chiefs. Los Angeles Chargers wide receiver Mike Williams rushes for a 19-yard touchdown against the Kansas City Chiefs.